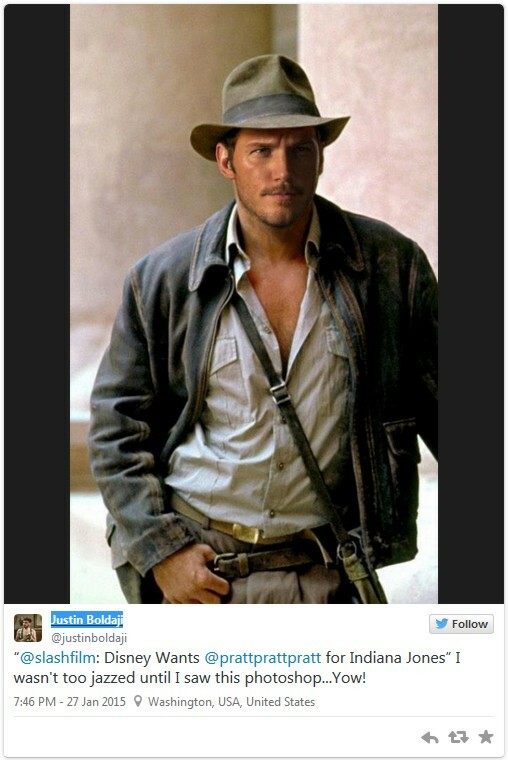 Disney Want Chris Pratt For Indy Jones. Home » Reboot Stuff » Disney Want Chris Pratt For Indy Jones. It’s being reported across the Internet that Disney are actively eyeing up Chris Pratt, (Guardians Of The Galaxy), for the lead role of Indiana Jones in a reboot of the infamous franchise. Having entertained the world with his recent outing as Star Lord I can think of no other actor so perfectly suited to carry on the character of Dr Jones, in the same vein as Harrison Ford. If you’re having difficulty picturing the actor in fedora, scuffed leather jacket and action slacks check the pic above by Justin Boldaji on twitter. Deadline have more on the rumour at this stage. If Disney are succesful in securing Pratt as Jones it means that the 35 year-old will be appearing in a remake of The Magnificent Seven, Jurassic World, the forthcoming Lego Movie sequel and Guardians Of The Galaxy 2. Only thing left for him to pop up in would be Star Trek 3 and one of the Star Wars spin-offs, which he would then have to follow up with a required mic drop. Boom!